Adapted from the stage play of the same name, Match is a film about discovery in a confined setting. It’s a little movie, with only three performers and taking place in a spacious apartment (by Manhattan’s standards). You need not have seen the play to know that this doesn’t have the same legs or the same oomph. The theatrics are perfect for theater; for film, boxed into the frame of the camera, it’s overtly exaggerated. It’s artificial sweetener with a bitter streak of sharp truthfulness and stowed away dishonesty. Match has too many minor missteps that add up to be a big problem. Thankfully the leading performance is not one of them. 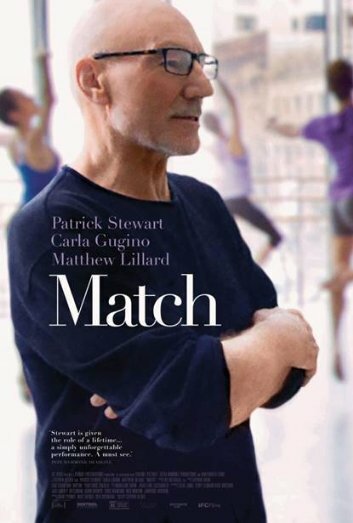 Tobias ‘Tobi’ Powell (Patrick Stewart) is an instructor at Juilliard, an old man who enjoys instilling discipline into his students at much as he does his solitude. Tobi never appears lonely, but he’s normally alone. He knits, cooks, tends to his foliage. Tobi can be a bit overwhelming at times with his social awkwardness and unabashed flamboyance. The character almost has too many layers, like a winter coat on a spring afternoon. You may want to shed him, might even feel a bit stuffy, but he is always warm. Tobi’s forthright and frank personality is refreshing. His personality is explosive. Movies need drama, and that comes in the form of married couple Lisa (Carla Gugino) and police officer Mike Davis (Matthew Lillard). Lisa claims to be writing a piece on the legendary instructor, and since drama is drama is drama, we know that’s not the whole truth. The three nimbly pirouette over the hardwood floors of Tobi’s apartment, drinking and smoking joints, using the helpful social lubricants to have open conversations between strangers. Mike is uptight and high-strung, clearly on edge and played with zero diligence by Lillard…it’s almost welcoming when he disappears from the film. As his character discusses the statutes of Chaos Theory early on, the film shifts into playful yet forced interactions. Chaos indeed ensues. Match preaches to the aging process and how at any point in our lives things can rapidly change. We’re never too old to see/understand emotions and situations differently. I imagine this story would be an awakening if experienced in real life. As a film, it is forgettable, and you sense that these characters just as easily put the story behind them as well. A scenic route of tumult. I’d argue that the only substantial merits lie in the restrained and showy performance by Patrick Stewart, perfectly cast here as the once sexual explorer of the 60’s now at the end of the twilight of his youth. I’d like to have a conversation with a pensive person like Tobi out in the open, fresh air and blue skies, as free and liberated as the man himself. Match is boxed in, literally, and the potential for liveliness is slowly suffocated away from the get go.